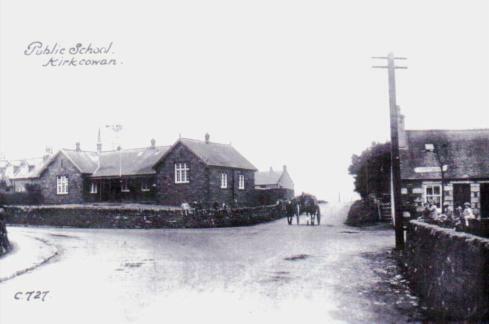 There have been a number of schools in the village, parish and private. 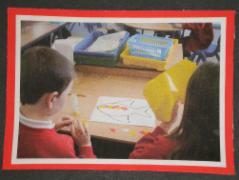 The photograph above is of the present school in Wellhouse Road. The Parish School was started at Ballgreen in 1830 (evidence of the date can be found on the wall of what is now a byre but was in fact the school). It is believed that the first Headmaster was Alexander Livingston. This school closed in 1862 when the present school was built. The last Headmaster was Mr McCallum who was appointed to the new school. 1. Girl's School run by Miss Steven at Beechgrove. The school catered principally for girls with the main subject being sewing. 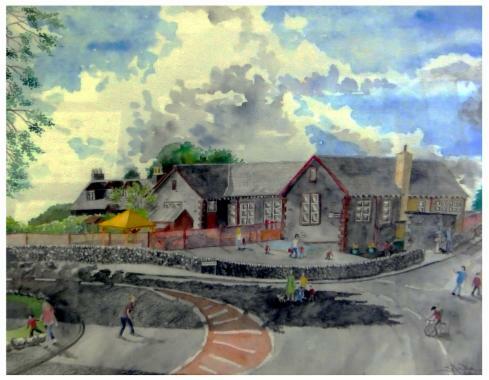 It is not known when the school opened but it continued up until 1880. In 1873 there were 41 pupils. 2. Boy's School run by local man William McKie (who had a club foot). Although it is not known when this school was set up it is understood that William McKie was employed at the Parish School at Ballgreen but failed to get a position at the new school and consequently set up his own school. The school closed when William McKie died in 1872 age 34. William McKie was my grandfather's (also William McKie) uncle. Candlemas Day (2nd February) seemed to be a special day in the school calendar as on this day the pupils brought in money to the teacher and, in return, were given oranges as a special treat. Discipline on this day was somewhat lax and the children threw orange peel and pips at the teacher. At the point when it got out of hand school would be dismissed and the children sent home. Around 30 children attended the school. 3. Small Children's School (age up to 8/9) run by Peggy Mark. The school was held in her house in a room which also contained the kitchen utensils and her bed. 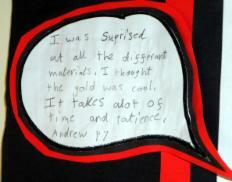 The fire was on the earth floor, kept in place by stones, with the 18 or so children seated on chairs around the walls. The children were required to take in a piece of peat every day for the fire and the child who brought in the largest piece was allowed to sit nearest to the fire. In addition to this each child had to bring in a penny every Monday to pay for their education. This made up only part of Peggy's income as she also sat "flow'rin her wab the hale day' (wab is embroidery). As at the Boy's School, Candlemas Day was a special day and the children were expected to bring something special for the teacher - nothing less than silver was acceptable. The children were given a treat which, at Peggy's school, was 'whisky toddy' ! The parish minister Dr Charles was known to visit on these days ! Apart from the 'Penny Book' the only reading material in the school was the Bible. The Present School opened in 1862 in Wellhouse Road with Mr McCallum as the Headmaster. He retired in 1898 at the age of 72 having been in teaching for 57 years. From the start the school had a bad reputation for truancy which led to bickering between the School Board and Mr McCallum. The truancy continued beyond the latter's tenure until about 1929. However, Mr McCallum, himself, was often in trouble with the School Board as he tended to take unauthorised time off and brought his greyhounds into the school. It is said that he washed his dogs in the school and dried them in front of the fire. The boys knew their teacher was fond of his dogs and used this to their advantage e.g. on one occasion a boy arrived late and was threatened with the tawse (strap/belt). "Please sir", he said, " my faither says 'e hae the best dog in the parish, an could 'e come tae the meet at the 'Mark' the morn ? - needless to say the boy was not punished. In 1875 there were 133 pupils at the school. During WW2 the headmaster was William Heatlie who was also Deputy Chief Observer in the Royal Observer Corps. (Rev Hugh Tolland was Chief Observer). Local girl, the late Molly Parker (nee Armstrong) was a 'weel kent' and highly respected Head Teacher between 1969 and 1980. 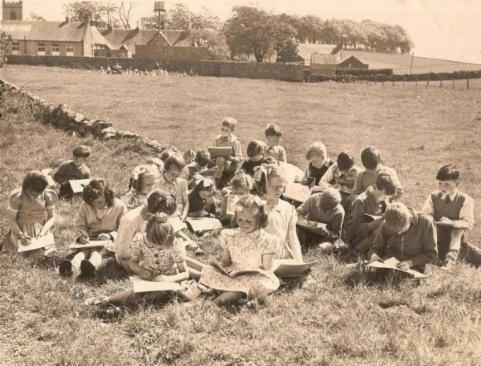 Sometimes classes were held in the fields behind the school - new housing is there now. 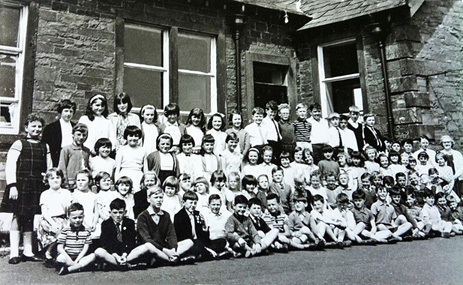 The whole school in 1966 with Head Teacher Molly Armstrong. - reporting on a remarkable celebration of 150 years. The school opened on 22nd May 1862 - headmaster Mr John McCallum. The school has seen a number of head teachers since then including Mr Cuthbert, Mr Douglas Rae, Mr Bill Heatlie, Mrs Molly Parker, Mrs Betty Marshall and Miss Dunse - 150 years after Mr McCallum the Head Teacher is now Mrs Olive Caldwell. 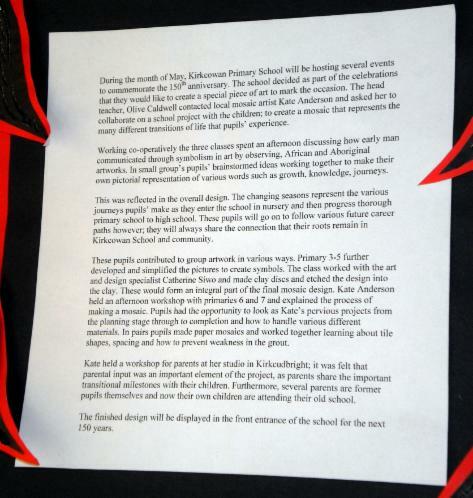 The following reports about the 150th celebrations have been written by the pupils in Primaries 3/4&5 and are reproduced by kind permission of the school. 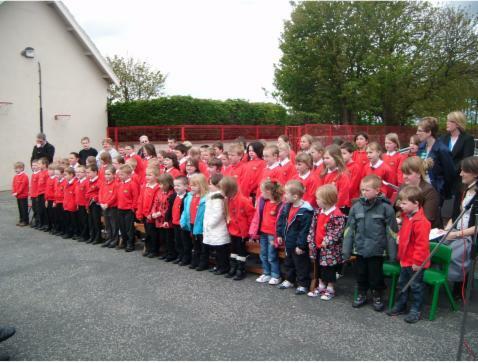 On the 19th of April the whole of Kirkcowan School got scrubbed up for a photograph to celebrate the school being 150 years old. The pupils looked very smart in their uniform (some even sported the new red and black school tie). Staff also came along dressed to impress in black and white. The photographer Mr Leigh was very good and patient because it was a very windy day. 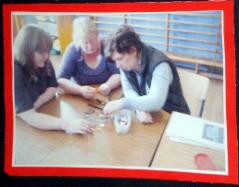 A copy of the photograph was put inside the school’s time capsule at the official ceremony on the 18th May. 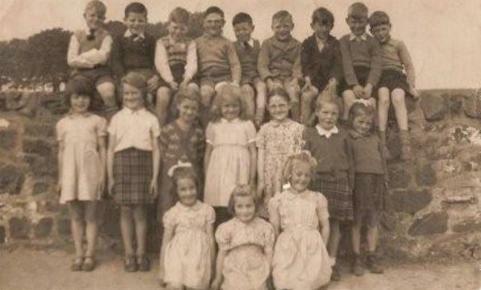 One primary 4 pupil said “I loved getting the photograph taken I thought everyone looked really smart and it will show people in the future what we used to wear to school”. Kirkcowan School’s 150 years Committee organised a very successful Tea Dance on Saturday 12th May in the village hall from 2pm -4pm. 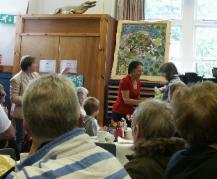 All members of the community were welcome to come along. Dr Mary Marshall and Mr Archie Marshall, who came along to play and entertain at the interval. Kirkcowan School’s Head Teacher Mrs Caldwell gave a speech to thank everyone for coming along and thanked the committee for all their hard work. When asked to comment on the afternoon, a former pupil of Kirkcowan School Margaret Cassie said “Lovely to return to the village to join in the 150th celebrations”. 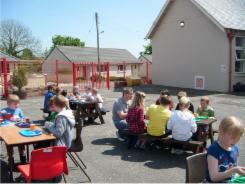 Also, a grandmother of a primary 4 pupil, Kay Ribbens said “What a super afternoon, really great idea and thank you”. 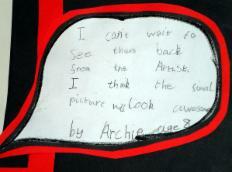 Rain Rain Go Away Kirkcowan School’s Time Capsule is here to Stay. 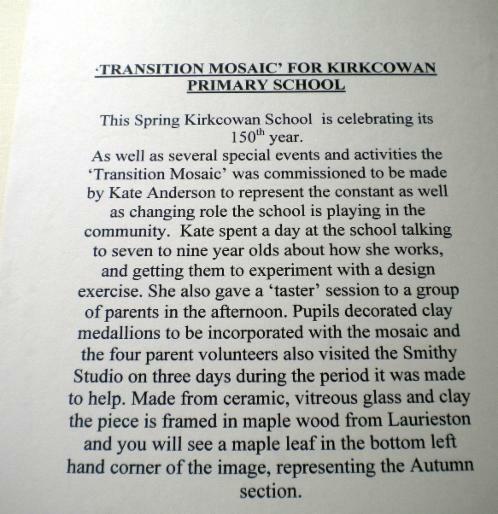 On Friday 18th May the event of a life time took place in the playground of Kirkcowan School, the placing of the time capsule inside the specially crafted cairn to mark the school’s 150th birthday. All the preparations for the big day were planned weeks in advance and pupils, staff and the 150th anniversary committee had their helping hands on that day to ensure the ceremony went smoothly. The weather was a bit unpredictable however at 2pm the excited guests brought the sunshine with them, with only a little hiccup of rain towards the end. (left: Items ready to be placed inside the time capsule). (right: Ruth Rudd and Jenny Wright, parents and part of the 150th Committee placing the time capsule inside the cairn). Mrs Caldwell, Head Teacher, welcomed everyone and spoke about the strength of the community and how the school greatly benefited from their support. 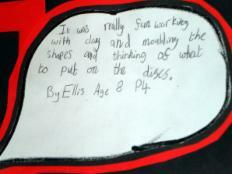 Lisa Wright, P6 pupil, gave a very informative history of the school building. Former Head Teacher Mrs Marshall who taught in the 1980s talked about life in a rural school. Chair of the parent council, Jamie Ribbens spoke about his fond memories of being a pupil at Kirkcowan and how important the parent council was at supporting the school. 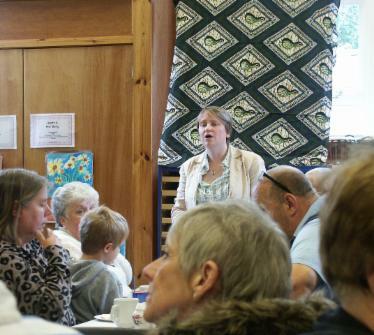 A former parent of the school Janice Sommerville said “Great event, interesting information about the school history. Well done”. The entertainment for the afternoon was very well received. A P7 pupil, Nathan Paterson, played the bagpipes to welcome everyone. Then the whole school sang their version of ‘Caledonia’ with words to express how they feel about their school. 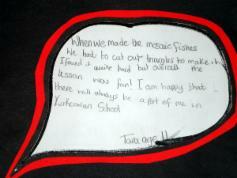 Primary 7 pupils Nathan Paterson and Andrew Bodle read a very old poem called ‘Oot of this world and into Kircoan’. 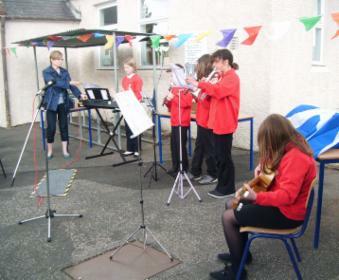 A group of musicians known as ‘Kirkcowan Kids Orchestra’ composed and played a song called ‘Memories Made’. 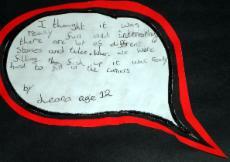 One primary 4 pupil said “The song brought a tear to my eye”. (left: Nathan Paterson welcomes the guests). The most important part of the afternoon was placing the time capsule inside the specially built cairn. 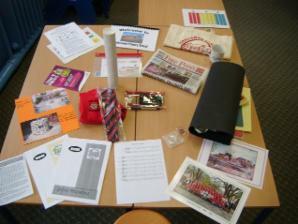 The pupils had thought long and hard about the items to go inside the time capsule which would best reflect school life at present. The time capsule was unveiled to everyone by Leona Rudd (oldest pupil in the school) and Owen McKeand (youngest pupil in the school). 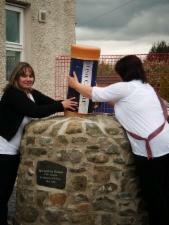 Then Ruth Rudd and Jenny Wright, both parents on the 150th committee, placed the time capsule in position. Stephen Stables, parent of a P4 pupil said “Fantastic effort by the kids, here’s hoping there is still a school here in another 150 years”. 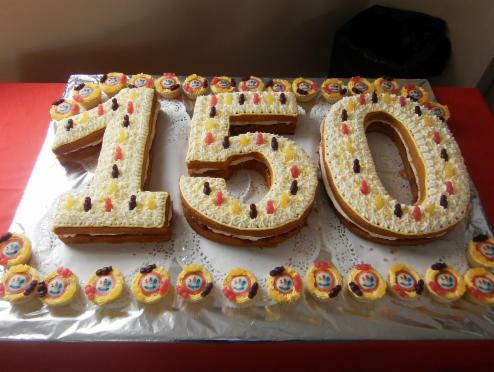 Steve Brown, Parent and Kirkcowan’s answer to Jamie Oliver, made the amazing 150th anniversary cake. 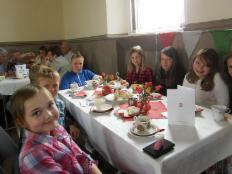 The dinner hall was decorated with bunting and fine crockery and guests were invited to have sandwiches and cake after the ceremony. 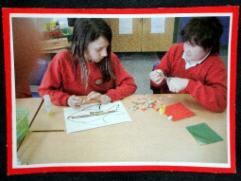 Speaking about the whole afternoon, Betty Marshall former Head Teacher said “What a wonderful, exciting afternoon”. 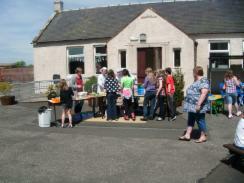 On the School’s official birthday, 22nd May, pupils had a non uniform day and enjoyed a glorious afternoon in the sunshine with a fantastic barbecue organised and cooked by Mrs Stewart and Miss Gray, catering assistants. The pupils were then delighted to have the popular children’s entertainer Tony Bonning to round off the afternoon with hilarious and fun packed songs and stories. 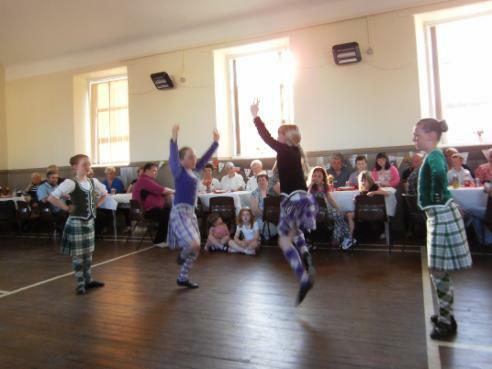 Kirkcowan Community had their feet on the go at the Celebratory Ceilidh. 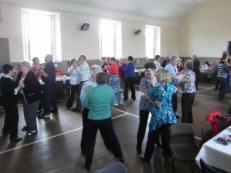 It was dance, dance, dance on Saturday 26th May as Kirkcowan School’s reunion ceilidh went off with a bang at St Couan’s hall. This event was one of the last celebrations to mark 150 years. Lots of people turned out to celebrate and the night was a great success. Miss Dunce, former Head Teacher, called out the dances for the evening and the programme of dances included Gay Gordons, Dashing White Sergeant and Canadian Barn Dance. To break up the Ceilidh dancing ‘Wallace School of Dance’ performed six Highland dances these included a hilarious performance of ‘Donald Where’s your trousers?’ by Callum Adams and the Highland fling performed perfectly by Libby Adams and friends. Nathan Paterson, P7 pupil of Kirkcowan School, played his bagpipes at the interval and a primary 4 pupil said “Nathan played so well for such a young age”. 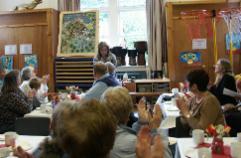 During the break there was also a raffle with lots of exciting prizes. A grandmother of a P4 pupil won the top prize of tickets to a Stranraer football game. Archie Mortiboy, the lucky grandson said “What a brilliant prize”. There was a delicious buffet which included sandwiches, pizza, quiche and lots of other scrumptious food. Mrs Caldwell thanked everybody for coming and the 150th anniversary committee for making the night such a success. A parent of a Wallace School of Dance pupil said of the evening “A lovely, friendly night. Thanks for asking us. Here’s to the next 150 years. The final event of the celebrations took place on June 16th and was extremely well attended - indeed at times it was quite a crush. There was an opportunity to wander around the classroom to see the work carried out by the children and to view a wide range of old photos of the school in days gone by. In fact the most crowded area was that showing photos of former pupils which was surrounded by those of us of a certain age. 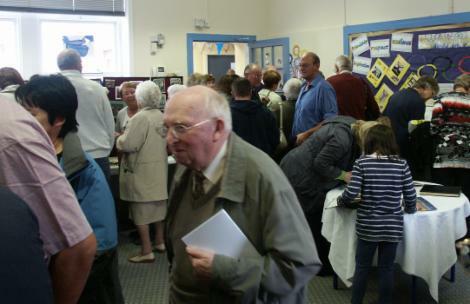 The enrolment registers were also on show and everyone searched for their own entry and those of their ancestors. This was also an ideal opportunity to meet up with long lost friends. 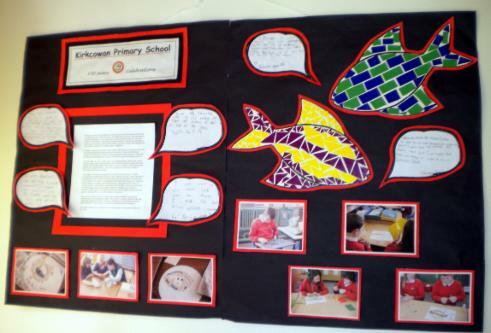 The school had laid on a feast in the hall where we also witnessed the unveiling of the specially commissioned mosaic 'Transition'. The following describes how it all started. 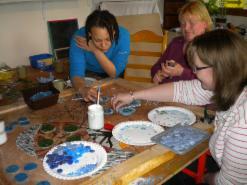 Catherine Siwo (Arts Officer) and parents Lynne, Wendy, Shalla and Catriona visit Kate's studio (work in progress). 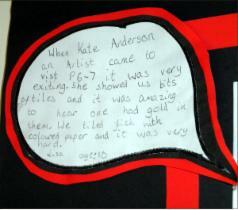 The children produced a collage of the experience which is hanging proudly in Kate's studio. Kate has been quoted as saying that the school was the most friendly she had visited and that the pupils and staff were relaxed and very easy to talk to. Olive Caldwell welcomed everyone and thanked all those who had helped to organise the celebrations particularly the 'working committee'. 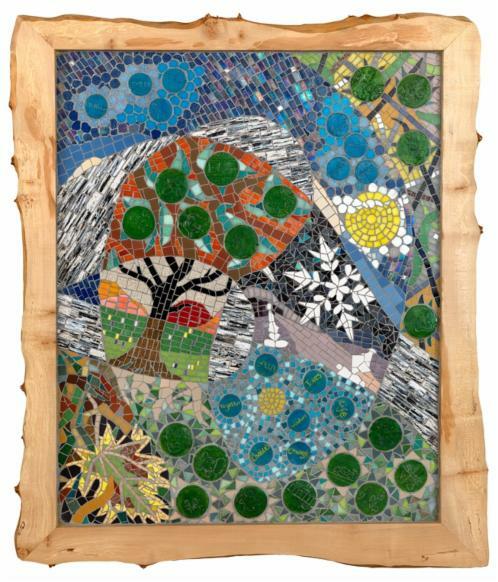 She then thanked all those who had been involved in the mosaic project, in particular Kate Anderson who had designed the piece and had worked hard to involve the pupils, staff and parents. Kate was then invited to unveil the piece entitiled 'Transition' and is presented with a bouquet by Catherine. And finally what a triumph 'Transition' is.